Fou Gallery is pleased to present Lin Yan: Paperweight from February 28 through March 21, 2014. The exhibit, concurrent with her project at Tenri Culture Institute, will feature several recent small works and a site-specific “Cloud” installation. 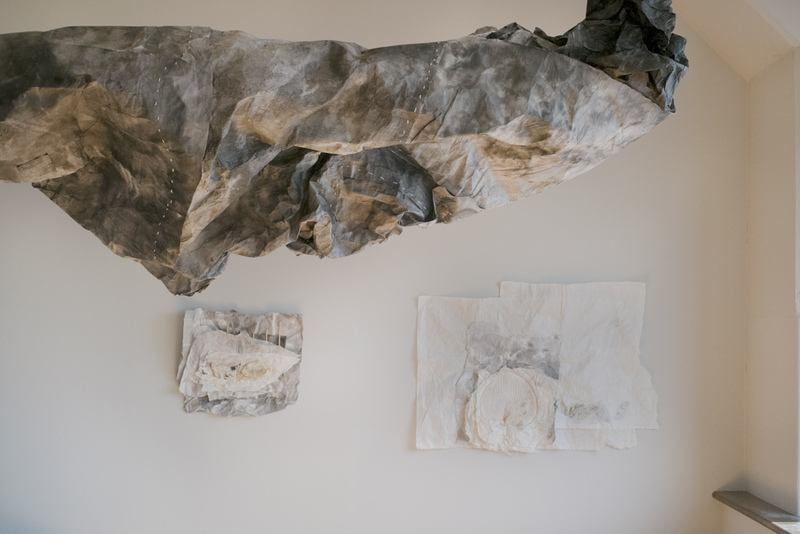 As suggested in the exhibition title, recent works of Lin continue her interest in sculptural paper collage, the foundation of which is a variety of hand-made Xuan paper. Xuan paper is renowned for being soft, fine textured, translucent, suitable for conveying the artistic expression of Chinese traditional painting and calligraphy. Lin Yan makes sculptural collage with crumbled layers of papers with ink, creating a paradoxical affect of strong, post-industrial feeling. The exhibition also expresses Lin’s ecological intention and social concern. Among the works in the exhibition, are a series of paper collage, Air, Breath and Breeze, which refer to the unprecedented air pollution in Beijing. By incorporating elements in the environment into her work, Lin further blurs boundaries, embraces conflict and calls on public awareness of evolving ecological and environmental threats. Lin Yan: Paperweight coincides with Lin Yan: Dispelling the Clouds, on show at The Art Gallery of Tenri Cultural Institute, 43 West 13th Street, through March 13th, 2014.